The front soundstage includes three SK2-3300 four-way speaker systems with dual 10-inch woofers, featuring beryllium midrange and ultrahigh-frequency compression drivers in a specially designed Bi-Radial combination horn, incorporating JBL’s most advanced professional technologies. Enveloping the listener, and invisible to the naked eye, six S4Ai multipole in-wall ambient surround speakers, each with three 1-inch titanium high-frequency tweeters, two 4-inch mid-bass drivers and one 8-inch dual-coil woofer. Powerful, rich bass emanates from two S1S-EX 18-inch 800-watt subwoofers. The electronics package includes the SDP-45 processor/controller, SDEC-4500 digital equalizer, two SDA 4600 (4 x 600 watts) and two SDA 8300 (8 x 300 watts) power amplifiers. The Synthesis® Atlas™ 9.2 multichannel cinema/music system is suitable for rooms sized approximately from 2,000 ft3 to 30,000 ft3. The SDA 8300 and SDA 4600 are designed for maximum power, minimum space while seamlessly integrating into any JBL Synthesis System. The amplifiers digitally connect to our SDEC Room Equalizer for a complete end-to-end digital solution and also stand on their own in a wide array of upscale applications. With greater accuracy less weight and superb signal to noise performance both the SDA 8300 and SDA 4600 deliver best in class performance in an easy to install space-saving design. With 4th-order electronic crossover networks for use with the bi-amplified speaker in the Synthesis One Array™ system or running full-range for the largest Everest, K2® and Atlas™ systems, the SDEC-4500P offers up to 12 channels of input and 20 channels of output with more than 500 bands of parametric EQ running at 24-bit and 96kHz, making this system better than anything you’ve ever heard at the cinema or theater. Custom configurations for special needs can be created by JBL Synthesis Engineering to suit any installation you can imagine. Designed for those seeking the ultimate in audio and video performance, the JBL Synthesis® SDP-45 4K surround processor/controller provides the highest level of sonic performance available while offering pristine video with flawless HDMI® switching. With 24-bit/192kHz A/D and D/A converters and two 32-bit floating-point DSP engines, there is no shortage of processing power for decoding the latest lossless audio. Featuring eight HDMI inputs and two HDMI outputs, extensive analog and digital audio inputs and outputs, and a USB connector to provide computer sound-card functionality, the SDP-45 4K is perfectly suited for complex home theater systems and even includes an independent second audio zone. HDMI technology offers uncompressed multichannel sound both from Blu-ray™ players and from popular computer-based sources that can provide high-resolution audio. The choice of processors for HDMI audio is critical, since audible artifacts resulting from digital “jitter” are common. The SDP-45 4K solves the problem by providing a completely asynchronous signal path from its A/D converters and all digital inputs, allowing the outputs to be completely buffered and internally clocked to a very stable crystal oscillator. This sophisticated approach provides sonic clarity and a lack of “grit” that truly reveals the potential of today’s uncompressed Blu-ray and high-resolution digital sources, and it optimizes legacy analog sources. The broadcast-quality HDMI switcher provides smooth audio and video switching, can pass digital video up to 1080p, 12-bit, and is compatible with 3D video formats. BRINGING RAREFIED POWER AND UNEQUALED REALISM, AND SURPASSING THE HIGHEST EXPECTATIONS OF THE WORLD’S MOST DEMANDING LISTENERS. The Synthesis One Array system pairs the dual 8-inch SAM2LF with the 3-inch compression driver/constant directivity horn of the SAM1HF for a bi-amplified speaker system capable of frequencies from 80Hz to 40kHz from the front left, center or right, four S4Ai dipole ambient surrounds and four S1S-EX 18-inch, 800-watt subwoofers. With an electronics package that includes the SDP-45 processor/controller, the SDEC-4500P active-crossover digital equalizer, two SDA 4600 (4 x 600 watts) amplifiers and two SDA 8300 (8×300 watts) amplifiers, Synthesis One Array sets new standards of technological innovation and manufacturing quality, and delivers an unequaled listening experience. Synthesis® One Array™ 7.2 multichannel bi-amp cinema/music system is suitable for rooms sized approximately from 1,500 ft3 to 25,000 ft3. In Synthesis Two Array Systems, the main left, right, and center SAM1HF and SAM2LF loudspeakers feature dual 8-inch mid-bass drivers and reproduce high frequencies with a 3-inch Aquaplas-treated aluminum compression driver mounted in a vertical SonoGlass® constant-directivity horn and ultrahigh frequencies with a 1-inch pure-titanium compression driver. Meanwhile, the SAM12x passive crossover manages all the power the S7165 can supply. Four S4Ai in-wall multipole ambient surround speakers, two S2S-EX 15-inch, 1200-watt passive subwoofers and electronics that include an SDP-45 processor/controller, SDEC-4500P digital equalizer, two SDA 4600 (4 x 600 watts) amplifiers and a SDA8300 (8 x 300 watts) amplifier round out the Synthesis Two Array system. It delivers all the realism of today’s most sophisticated digital sources. And it’s all the sonic muscle 8,000-ft.³ rooms can handle. Synthesis® Two Array™ 7.2 multichannel passive crossover cinema/music system is suitable for rooms sized approximately from 1,500 ft3 to 16,000 ft3. Synthesis Three Array is designed to give your architect or designer maximum leeway in creating your ideal listening space. The all-important center channel speaker, for example, is available in designs optimized for either vertical (SAM3VA) or horizontal (SAM3HA) installation. 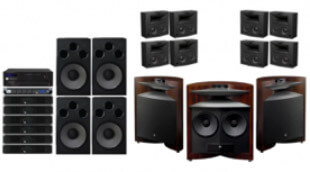 The main left and right SAM3VA speakers may be cabinet-/custom-mounted, or configured as freestanding floor units with two S2S powered subwoofers. Four S4Ai in-wall multipole ambient surround speakers and electronics that include the SDP-40HD processor/controller, SDEC-3000 digital equalizer, S7165 7-channel amplifier and S820 amplifier complete a package that will fill rooms with edge-of-your-seat home entertainment. Synthesis® Three Array™ 7.2 multichannel home cinema/music system is suitable for rooms sized approximately from 1,500 ft3 to 10,000 ft3. THE HIGHEST PEAK IN AUDIO REDEFINED. Of those who seek perfection in sound reproduction, only a handful have actually achieved it. It is a rare occurrence when an individual or group is able to triumph over the constraints of technological reality just once. At JBL, this has happened eight times. In each case, our engineers were told to build the speaker system they had always wanted to build. Whatever resources were required would be available. Thus began an ongoing investigation into new frontiers of sound reproduction, beginning in 1950 and continuing to the present day. The products that have resulted from this venture are now known as the JBL Project loudspeakers. Each represents the absolute peak of every technological, material and engineering innovation available at that time, combined into a single system. They are Hartsfield, Paragon, Project Everest DD55000, Everest DD66000, K2 S9500/7500, K2 S5500, K2 S9800 and K2 S5800. The newest is Project Everest DD67000. Three Project Everest DD67000 speakers in front of you, eight SK2-3300 surrounds and four 18-inch S1S-EX subwoofers, powered by 5 SDA 4600 (4 x 600 watts) and (1) SDA 8300 (8×300 watts) amplifiers, create the most realistic and inspiring system JBL Synthesis has ever designed. Hearing is believing. Synthesis® Everest is a 11.4 multichannel cinema/music system that is suitable for rooms sized approximately from 3,500 ft3 to 100,000 ft3. FRONT AND CENTER, THE INTERNATIONALLY AWARD-WINNING K2 S9900 IS ONE OF THE MOST REFINED AND SPECTACULAR SPEAKERS EVER CREATED BY JBL. Featuring Magnesium and Beryllium high-frequency and ultrahigh-frequency compression drivers, and a specially designed Bi-Radial horn, high frequencies are reproduced to beyond 40kHz, while a massive 15-inch woofer thunders down to below 40Hz. In short, the K2 S9900 is designed to produce extraordinary sonic accuracy. All around you, six S4Ai in-wall dipole/bipole ambient speakers, each with dual 2-inch high-frequency and dual 8-inch mid-bass drivers. And from everywhere and nowhere, gloriously rich, clean bass from four S1S-EX 18-inch, 800-watt subwoofers. In all, 13 exceptionally refined loudspeaker systems, driven by the SDP-45 processor/controller, an SDEC-4500 digital equalizer and five SDA 4600 (4 x 600 watts) and one SDA 8300 (8 x 300 watts) amplifiers. A no-expense-spared entertainment system for listening rooms of up to 75,000 cubic feet, Synthesis K2 delivers up to 8,000 watts of power and achieves sound-pressure levels as high as 105dBA without distortion, making it one of the highest-power, highest-performance, highest-quality systems ever developed for residential use. The Synthesis® K2® 9.4 multichannel cinema/music system is suitable for rooms sized approximately from 2,500 ft3 to 75,000 ft3. Exposed vertical constant-directivity horns, for improved sonic accuracy at high listening levels, have long been a staple of JBL installations in concert venues around the world. The Synthesis Project Array™ system brings the concept home for the first time, with spectacular results. Two three-way floorstanding 1400 Array loudspeakers flank a three-way 880 Array center channel speaker and are supported by four 15,” 1000-watt 1500 Array powered subwoofers and four S4Ai in-wall multipole surround speakers. Electronics include the SDP-45 processor/controller, SDEC-4500P digital equalizer and SDA 8300 (8 x 300 watts) amplifier. Synthesis® Project Array™ 7.2 multichannel cinema/music system is suitable for rooms sized approximately from 1,500 ft3 to 16,000 ft3. A partnership between JBL Synthesis and Trinnov in the development of the SDP-75 processor has laid the stage for the success of the SDP-75. With over 60+ years of audio experience JBL has become the choice of almost all top music and movie professionals in the industry. This experience has allowed JBL to release some of the most influential products being used today. Trinnov Audio brings years of experience building top of the line processors for numerous consumer and commercial applications. Their team of passionate audio engineers and professionals helps bring to life innovative solutions that are always improving the quality of sound. 32 or 16 Channel Digital Audio Processor / Universal Spatial-Accurate 3D Audio playback / 118 Digital and Analog Inputs and 80 audio Outputs / 8x HDMI Input, 2x HDMI Outputs / User-friendly, self-explanatory user interface / Built-in WiFi & UPnP/DLNA Compliant Digital Media Renderer / Wide choice of Remote Options. Weight: 14kg Power consumption: 90 W max. The SDP-25 is a high-quality surround processor that is ideally suited for moderately-priced systems while still maintaining the iconic sound quality that is inherent in every JBL Synthesis product. Offering exceptional versatility and superb ease of use, the SDP-25 sets a new standard of value for surround processors. The SDA 7200 has been designed to deliver the best possible sonic performance regardless of the content being played, whether it is the latest blockbuster movie, a major sporting event or your favorite music. Although the SDA-7200 has been developed to complement JBL Synthesis products it is equally at home when connected to any high-quality multi-channel preamp processor with or without an external EQ system connected. Its high-power design also means that it has the flexibility to power Synthesis speakers or virtually any high-quality speaker system from premier in-ceiling speakers to the largest floor standing models. Of course, regardless of the speakers, the SDA-7200 delivers the performance JBL has been known for in close to 75 years of creating cinema sound. The SDEC3500 Equalizer is a high-performance equalizer offering comprehensive EQ and audio optimization capabilities. It optimizes the performance of a JBL Synthesis system in any room using more than 500 bands parametric digital equalization that can be precisely fine-tuned in level and bandwidth to correct for the dips and peaks in the frequency range that are inherent in any room and yield flatter, more accurate frequency response. The SDEC3500 can apply this equalization to all main, center and surround speakers and subwoofers in a system. Blu Link output provides a digital connection to JBL Synthesis SDA8300 and SDA4600 amplifiers. Sound Field management using four subwoofers is available on the Blu link connection only.